I've got a whole box of old sheer curtains rescued from the recycle center, with the full intentions of using them myself in my house - but when I started to pull them out to look at them, I realized they were pretty much past using and somewhat damaged. My garden won't care what they look like, and sometimes that much protection is all your precious plants need to withstand a summer hail storm, or the risk of frost. As they all have a large hem, which normally would be on the lower end of the curtain, I insert a long fairly straight stick into hem, and use this to hold the end down once it's in place, but also as a handle to move the curtain around. In moments, as a hailstorm threatens, I can cover my tomato plants which can't take much of that kind of abuse, or my other plants like delicate lettuce or peas. Just flipping the waiting curtain over tender plants with the long stick takes just a few moments. Some crops, like potatoes, I don't bother covering as they can rejuvenate quickly after almost complete defoliation. 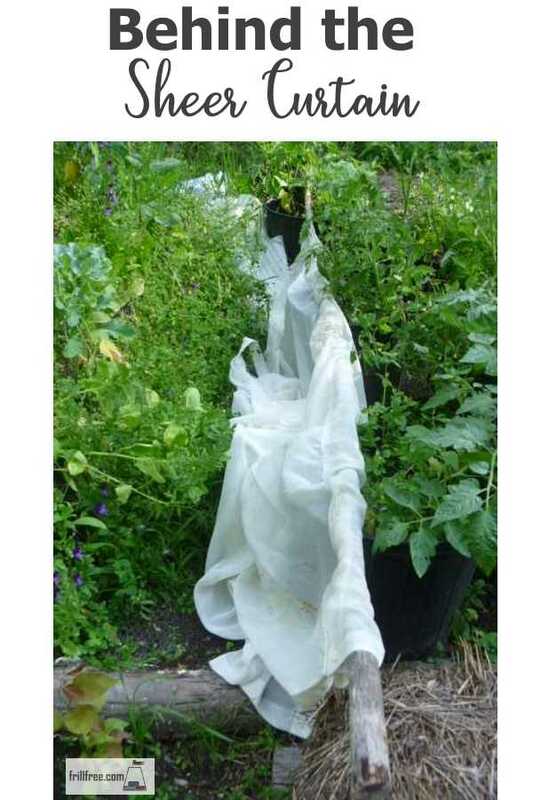 I use these sheers on my brassicas too, to prevent those evil white butterflies from laying their eggs on them, which turn into green caterpillars that munch holes in the leaves. So, look in thrift stores for some cheap nylon curtains for your garden; your plants will thank you.